This year, and for the first time in five years, 50 million drams (about $90,000) have been allotted from the budget of Armenia for preservation of historical monuments. "Of course 50 million drams is a small sum but it is important that the sum has finally been allotted and from year to year this sum will be increasing," says Deputy Minister of Culture and Youth Affairs Gagik Giurjyan. Three monuments are scheduled to be restored from the allotted sum: Vorotnavank (medieval architectural monument and monastery in Sisian), Bardzrial cross (in Noyemberian) and the old bridge of Ashtarak. Plans are now being proposed for how the work will be conducted, after which bids will be held to contract the work. According to the Agency of Historic Preservation and Preservation of Monuments, more than 30,000 monuments and 4,000 historic complex are being evaluated. "Twenty-seven to 30 monuments are in extremely terrible conditions and require immediate reconstruction, otherwise we can irrevocably lose them," says deputy head of the agency Samvel Musoyan. According to him, only small parts of those monuments have survived, while internationally accepted standards don't allow restoration of monuments if less than 30 percent of it still exists. Problems and issues concerning preservation and usage of monuments and preservation of historical sites are controlled by a law adopted in 1998. In 2003 another law was adopted. It is called the Law on Immovable Monuments "which are regarded as state property and are not subject to alienation." Giurjyan says, "the law allowed to differentiate those cultural and historical immovable values, which are not subject to alienation and are the sole property of the country." Some privately owned items are registered by the government as cultural and historical valuables. According to Giurjyan, in such cases the government can render financial assistance if it is possible. Within last five years, when there was no state financing, the Agency on Preservation of Monuments began to search for alternate methods. International joint organizations were founded. The agency presented programs on preservation of the cultural and historical monuments and international nongovernmental organizations (ngo) began to make investments. For example, Karedaran ngo was founded jointly with Italians, and through it Armenia got money from the World Monuments Fund. Catholicos of All Armenians Garegin II made big investments, when in 2001 on occasion of the 1700 th anniversary of the declaration of Christianity, 150 churches which had previously been regarded as state property were returned to the Holy See Saint Echmiadsin. The Government of Norway invested about $10,000 toward preservation. And the biggest donation came from the Lincy Foundation, which allocated $500,000 for the restoration of Garni and Zvartnots temples. According to Giurjyan, historic monuments will be preserved "in accordance with their initial goals. It is allowed to use and reconstruct them but, of course, without causing damage to them and changing their purposes." Lincy Foundation money is restoring Garni temple. 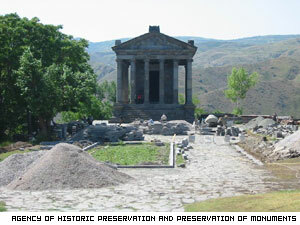 In 1993 within the framework of the convention on cultural and environmental heritage Armenia together with UNESCO approved a contract concerning preservation of monuments. "A country which signs the contract, undertakes an obligation to preserve and protect cultural and historical monuments of its country in accordance with international standards," says chief specialist of the Department of Preservation and Usage of Monuments and Historical Environment Artsrun Grigoryan.. "A country also undertakes obligation to present the best of its monuments to World Heritage Center so that the question of including them into the lists of World Heritage Center could be discussed." 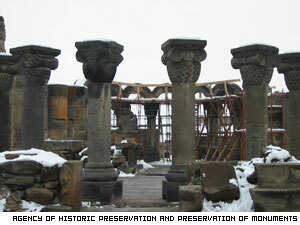 According to Grigoryan, today lists of World Heritage Center contain about 800-900 monuments presented by 120 countries. For the first time Armenia was presented in those lists in 1996, asking for recognition Haghpat-Sanahin monastery complex, churches of Echmiadsin, city and archeological site of Zvartnots, Geghard monastery – all of which contain some 300 or 400 monuments. Grigoryan says the 450 hectare area in Yeghegnadzor that includes Noravank church has been nominated for the list. "If there is a threat to any monuments included on those lists and our country cannot immediately remove that threat, then World Community will do everything to save these monuments. It means that not only our country attaches importance to these monuments but these monuments are also of international cultural importance," says Grigoryan.